With a still undetermined awards race and an industry undergoing tectonic shifts with the Me Too and Time's Up movements, awards shows have become canaries in the coal mine. There were big moments Sunday at the 24th annual celebration of actors, like Harvey Weinstein accusers Marisa Tomei and Rosanna Arquette naming some of the key silence breakers who lit the fuse to the movement, and big questions about what would happen if the recently accused James Franco and Aziz Ansari won in their categories (they didn't). But much of the evening was numbingly similar to what we've seen before, from the winners — like "Three Billboards Outside Ebbing, Missouri" — to the commentary on why the crusade is important and gestures like having nearly all female presenters. "We are living in a watershed moment," first ever SAG Awards host Kristen Bell said in her opening monologue, which stayed light. "Let's make sure that we're leading the charge with empathy and diligence." After winning big at the Globes, the Western-inspired revenge tale "Three Billboards" dominated the major film awards with wins for best ensemble, best actress for Frances McDormand and best supporting actor for Sam Rockwell. It was almost an exact repeat of the major Golden Globe Award wins with Gary Oldman also winning best actor for his portrayal of Winston Churchill in "Darkest Hour" and Allison Janney taking supporting actress for playing Tonya Harding's mother in "I, Tonya." With many prominent men in Hollywood facing accusations of sexual misconduct, virtually every aspect of the awards season has been impacted by the scandal — from questions on the red carpet to anxiety over who might be nominated, attend or win any given ceremony. Both Franco and Ansari two weeks ago won Golden Globe Awards while wearing Time's Up pins before being accused of sexual misconduct and, in Ansari's case, aggressive sexual behavior by an anonymous accuser. Both were nominated Sunday and lost, Franco to Oldman and Ansari to William H. Macy for "Shameless." "I think that above all what we've always said is it remains vital that anyone who remains victimized should have the right to speak out and come forward," Brie said, adding that in the case of Franco, "Not everything that has come forward is fully accurate." Franco has also called some of the accusations inaccurate, but after two days of facing questions about the claims on late-night television, "The Disaster Artist" star has kept a lower profile, although he was in attendance at the SAG Awards. He did not attend last week's Critics' Choice Awards. The winners, by and large, made sure to at least reference the moment. Rockwell, in his acceptance speech, said he was standing with, "All the incredible women in this room who are trying to make things better. It's long overdue." Most of the comments in the evening were forward-looking too. SAG-AFTRA President Gabrielle Carteris said, "This is not a moment in time. This is a movement." 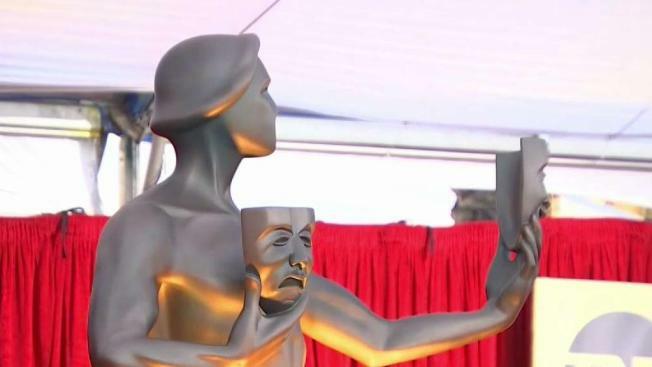 Big television winners included NBC's "This Is Us," which took the ensemble award for drama and won Sterling K. Brown the outstanding actor award, and HBO's "Veep," which got outstanding comedy ensemble and a best actress win for Julia Louis-Dreyfus. HBO's "Big Little Lies" picked up best actor in a miniseries wins for both Alexander Skarsgard and Nicole Kidman. "I'm so grateful today that our careers can go beyond 40 years old," Kidman said in her acceptance speech. "We are potent and powerful and viable. I just beg that the industry stays behind us because our stories are finally being told." But not everyone got a headline-worthy moment, Sunday. Lifetime achievement award recipient Morgan Freeman kept his remarks brief. Producers say the female-forward approach was inspired by last year's Women's March, but the show arrived at a time when some of the industry's biggest names are leading the Time's Up and Me Too movements to address gender inequality, sexual misconduct, pay disparities and other issues. The show comes two weeks after a black-dress protest at the Golden Globe Awards, and several stars including Meryl Streep, Emma Stone and Michelle Williams bringing activists to the show. 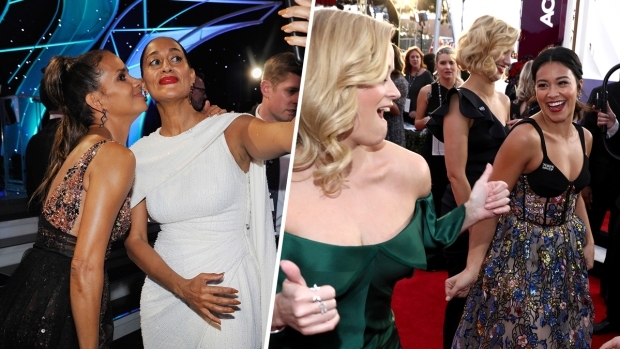 The SAG red carpet saw the return of colorful frocks and far fewer Time's Up pins — although some actors, like Kumail Nanjiani and Gina Rodriguez, were still sporting theirs. Tomei and Arquette provided perhaps the most memorable moment of the evening. While Arquette held back tears, they named some of the "silence breakers" in the movement including Asia Argento, Annabella Sciorra, Ashley Judd, Daryl Hannah, Mira Sorvino, Anthony Rapp and Olivia Munn. "So many powerful voices are no longer silenced by the fear of retaliation," Arquette said. "We can control our own destiny." Not every show can have barn burning Oprah Winfrey moment, but sometimes a trace of genuine emotion is just enough. AP Entertainment Reporters Sandy Cohen, Amanda Lee Myers and Mike Cidoni Lennox contributed.